Leonardo’s ultimate aim was to imitate nature by remaking nature, as opposed to slavishly copying natural forms. This would require a profound understanding of the relationship between the effects of natural appearances and the underlying causes that gave rise to their form. Equipped with this knowledge, Leonardo believed he could create forms equitable to those found in nature, many of which might be of great service to man. According to Vasari, Leonardo made clay figures which he covered with a soft linen dipped in wet clay. Using black and white pigment applied with the point of a brush he would execute studies such as this on fine linen with “great patience”. Strictly speaking, this is not a preparatory study, but an exercise in modelling in light and shade. In its sculptural effect, Leonardo has achieved a timeless perfection that remains unsurpassed to this day. Realising the importance of light and shade in painting, Leonardo planned to write a treatise on the subject, and outlined its proposed contents in his notes. Amongst other issues it would deal with the categorisation of shadows, an examination of their effects on colour and the effects of the colour on shadows. It would also examine how shadows are conditioned by distance from a given light source. Shadows appear to me to be of supreme importance in perspective, because without them opaque and solid bodies will be ill-defined; that which is contained within their outlines and their boundaries themselves will be ill understood unless they are shown against a background of a different tone from themselves. 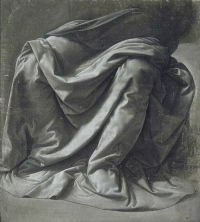 Studies of draperies of this type were executed in the Verrocchio workshop as a sort of training exercise in which the artist learnt how to model sculptural forms in two dimensions. This drawing is similar to the draperies of the Virgin in the Annunciation, although not exactly the same. It is likely that Leonardo kept such drawings in his portfolio so that they could be used as points of reference in paintings as and when the opportunity arose, and as examples for apprentices.